Isaac Leventon is an alumni of the University of Maryland (UMD), where he completed his BS, MS, and PhD with the Department of Fire Protection Engineering. He currently works as a Research Associate in the Fire Research Division at the National Institute of Standards and Technology (NIST). His research is in the area of upward flame spread over polymeric materials (including synthetic composites) focusing on the coupled feedback system between flame to surface heat transfer and material burning rate. Isaac also maintains a strong interest in developing student involvement and interest in science and engineering, mentoring and teaching at both the high school and university levels. He developed the pre-college program, An Introduction to Math and Physics through Fire Dynamics, which he led at UMD for three years and recently taught two classes - fire dynamics and structural fire protection engineering - as part of a new program led by UMD in Tel Aviv, Israel. In his free time, Isaac volunteers with the Gaithersburg Washington Grove Volunteer Fire Department and with the USA Warriors and MYHA Hockey Programs. With their expanding use in a variety of applications across a wide range of environments, especially with the continuing drive towards lighter and cheaper materials, synthetic polymers pose an increasing fire safety risk. Unfortunately, despite these mounting challenges, widely practiced test standards, which are used to indicate some level of fire resistance, are often severely limited in their ability to predict material behavior outside of test conditions and, to further complicate matters, conflicting assessments often arise between different tests. One aspect of flammability that is of particular interest is upward, concurrent flame spread over a material’s surface – a process that is almost always present in the early stages of a fire and that is a key determinant of its initial growth. Here, the existing understanding of flame spread dynamics is enhanced through an extensive study of the heat transfer from flames spreading vertically upwards across 5 cm wide, 20 cm tall samples of Poly(methyl methacrylate) (PMMA). These experiments have provided highly spatially resolved measurements of flame to surface heat flux and material burning rate at the critical length scale of interest, with a level of accuracy and detail unmatched by previous empirical or computational studies. Using these measurements, an analytical expression was developed that describes a flame’s heat feedback profile (both in the continuous flame region and in the thermal plume above) solely as a function of material burning rate . In a recent work, the flame model has been generalized through extensive testing of seven common materials – five pure polymers and two composites – which present distinctly different burning behaviors including melting, dripping, charring, and heavy soot formation (Fig. 1) . (from left to right) PMMA, POM, PP, HIPS, ABS, PBT, FRP. This wall flame model has been coupled with a powerful solid phase pyrolysis solver, ThermaKin2D, which computes the transient rate of gaseous fuel production of constituents of a pyrolyzing solid in response to an external heat flux, based on fundamental physical and chemical properties . ThermaKin has been successfully applied to the simulation of the combustion of non-charring  as well as charring polymers  in a cone calorimetry-type scenario. In both cases, the model was parameterized using mg-scale and g-scale property measurement techniques. Together, these works capture the two fundamental controlling mechanisms of upward flame spread – gas phase flame heat transfer and solid phase material degradation. The new unified model was employed to predict vertical burning and upward flame spread on 4 and 17.5 cm tall samples of PMMA with a reasonable computational cost and accuracy beyond that of current models. Model predictions – including time to ignition and initial, peak, and rate of rise of sample mass loss rate – were found to closely match experimental results . This work demonstrates the potential of using small scale measurements for assessment of flame spread dynamics through modeling and provides a framework for quantitative prediction of material behavior in response to a wide range of fire-like scenarios – two extremely useful capabilities for development of new, flame resistant materials. Ongoing research is directed towards expanding the application of this flame spread model to predict material behavior in the UL-94 and Room Corner Tests  and understanding the mechanisms by which flame retardants affect polymer flammability . Future work is aimed at quantifying processes that significantly impact material burning behavior such as polymer melt flow and soot deposition (Fig. 2). Following ignition of a 5_cm wide, non-charring, High Impact Polystyrene (HIPS) sample at its base, soot formed by its flame deposits at the material’s surface, downstream of the pyrolysis zone. As the burning region continues heating, producing a higher mass flux and thus larger flame, soot continues to deposit across the unburnt polymer creating a dark, thick, low density layer that acts as a thermal insulator. This layer effectively inhibits progression of the pyrolysis front, ultimately causing sample extinction when the initial pyrolysis zone reaches burnout. Similar behavior has been observed for other widely used, highly sooting, polymers including ABS. Figure 2. 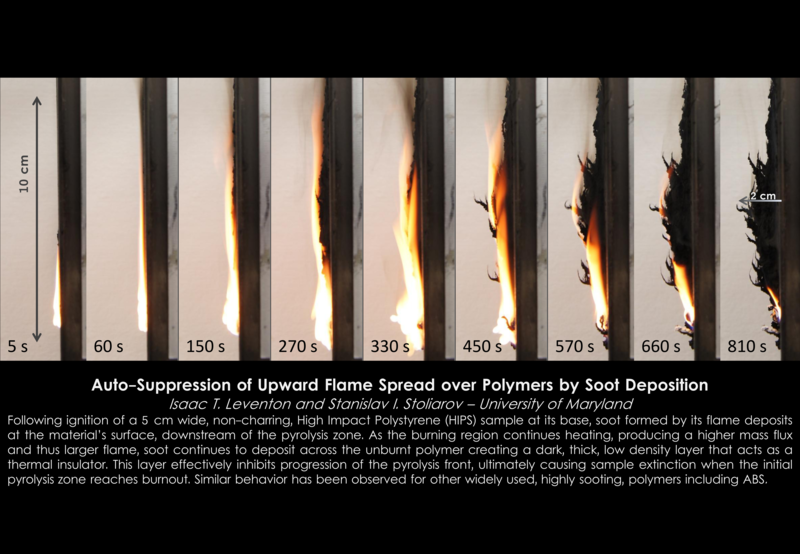 Auto-suppression of upward flame spread over HIPS by soot deposition. Times shown here indicate time after sample ignition. This work focuses on experimental measurement and computational modeling of twofundamental controlling mechanisms of upward flame spread – gas phase flameheat transfer and solid phase material degradation. Here, we demonstrate thepotential of using small scale measurements for assessment of flame spreaddynamics through modeling and provide a framework for quantitative predictionof material behavior in response to a wide range of fire-like scenarios – twoextremely useful capabilities for development of new, flame resistantmaterials. Leventon, I.T. and Stoliarov, S.I., Evolution of Flame to Surface Heat Flux During Upward Flame Spread on Poly(methyl methacrylate). Proceedings of the Combustion Institute 34: 2523-2530. doi: 10.1016/j.proci.2012.06.051. (2013). Korver, K.T. A Generalized Model for Wall Flame Heat Flux During Upward Flame Spread on Polymers. Department of Fire Protection Engineering, University of Marylan, College Park. Masters Thesis 2015. Stoliarov, S. I., Leventon, I. T. and Lyon, R. E., Two-dimensional Model of Burning for Pyrolyzable Solids. Fire and Materials 38: 391-408. doi: 10.1002/fam.2187 (2013). Stoliarov, S. I., Crowley, S., Lyon, R. E. and Linteris, G. T., Prediction of the Burning Rates of Non-Charring Polymers. Combustion and Flame 156: 1068-1083 (2009). Stoliarov, S. I., Crowley, S., Walters, R. N. and Lyon, R. E., Prediction of the Burning Rates of Charring Polymers. Combustion and Flame 157: 2024-2034 (2010). Leventon, I. T. and Stoliarov, S. I., A Flame Spread Simulation Based on a Comprehensive Solid Pyrolysis Model Coupled with a Detailed Empirical Flame Structure Representation. Combustion and Flame doi:10.1016/j.combustflame.2015.07.025 (2015).